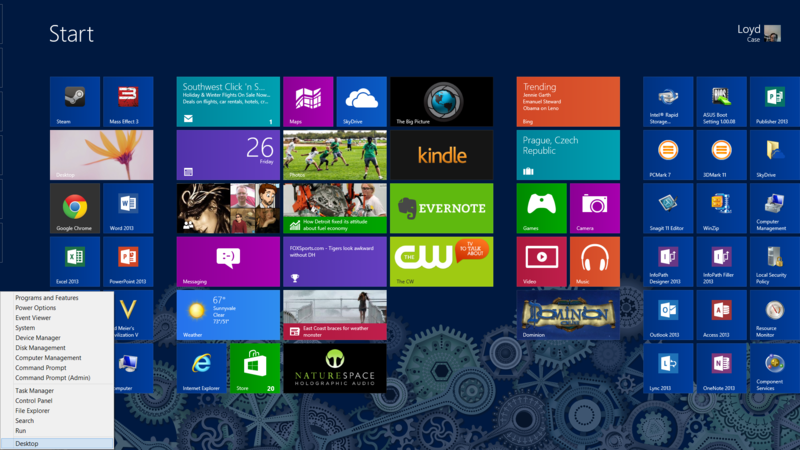 The Windows 8 UI: How do interface and usability experts rate all the changes? You've successfully installed Windows 8. You're staring at the Start screen, in all its flat-tiled glory, and it all seems completely alien based on your previous experience with Windows. As with any new version of an operating system, your first half-hour is critical. You'll want to learn the basics of navigation, how some important built-in applications work, and how to set up basic functions, including networking, backup, and user accounts. For this article, I'm going to assume that you now have Windows 8 running, and that you can see the Start screen and associated tiles. I'll also assume that all the current drivers, including networking drivers, are properly installed. First, let's go over some basic navigation tips. It's likely most early Windows 8 adopters will be using displays that lack Windows 8's ten-point multi-touch capability, though a few may spring for some of the shiny new systems that bring the touch interface to mainstream laptops and all-in-one PCs. So, we'll focus on basic keyboard and mouse navigation. Now, you did watch the one tip that Microsoft built into the setup process, right? What's that you're saying—you just clicked through the initial startup screens without reading them? Okay, most of us don't always read the text during the tedious setup. It's also likely that you skipped logging in to, or creating, a Microsoft account, opting instead for just a local account. That's okay too—though in a bit I'll touch on why a Microsoft account might be useful. But first, back to basic navigation. The key tip Microsoft showed you, in case you missed it, is simple: Move your mouse to the corners of the screen. As with all things Microsoft, though, it's not as simple as you might think. In different contexts, moving your mouse to a corner means different things. When you're in the Start screen, moving your mouse cursor to the upper right or lower right brings up the Charms bar. 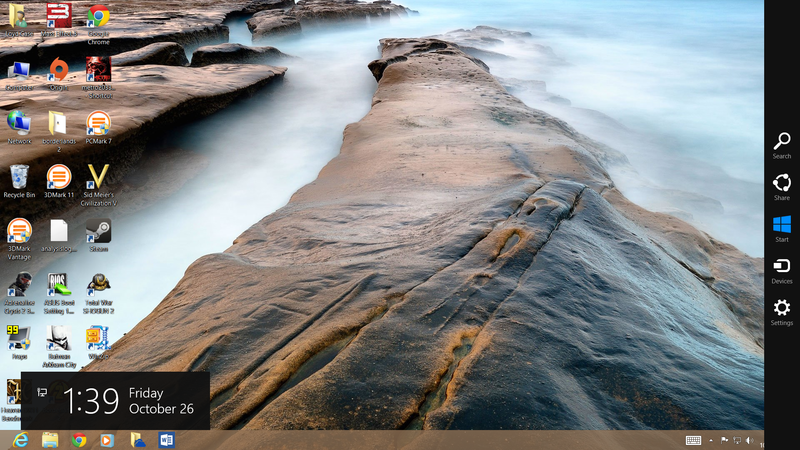 The Charms bar, along the right edge of the screen, is available both in desktop mode and from the Windows 8 Start screen. The Charms bar is simply a set of five icons on the right side that represent key system functions, and the bar is available wherever you are in Windows—even when you're in the traditional desktop. At first, you'll primarily care about two of the icons you see: the center, windowlike one, which returns you to the Start screen; and the Settings icon, which is the bottom one. The Settings icon is key, because that's where the shutdown/restart button now lives. Now, move your mouse to the lower left corner, and you get…nothing. Nothing, that is, until you run something else—your first Windows 8 app. Indeed, if you have active apps running, moving your cursor to the lower left will show you a small thumbnail view of the most recent app running (including the Windows desktop.) However, mousing to the lower left is not how you primarily return to the desktop. It's just how you get back to your most recently used app. Now, move your mouse cursor to the upper left corner, let it hover there for a moment, and then move the cursor down slightly, and the app-switching bar will pop up on the left side of the screen. This bar displays a thumbnail list of all currently running apps. You can then drag an app thumbnail to the right to make it take over your screen. If it's a Windows 8 app (and not a desktop program), you can run it in split-screen mode by dragging it down, and letting it dock to the left or right side. The app-switching bar, on the far left, lets you access Windows 8 apps from anywhere in Windows 8, including the desktop. Now here's an important trick for longtime Windows users: If you right-click in the lower left corner, you'll see the Simple Start menu. Simple Start is lets you quickly launch common system-management functions, like the control panel, disk management, the run dialog box, and so on. Simple Start pops up whether you're in desktop mode or in the Start screen. 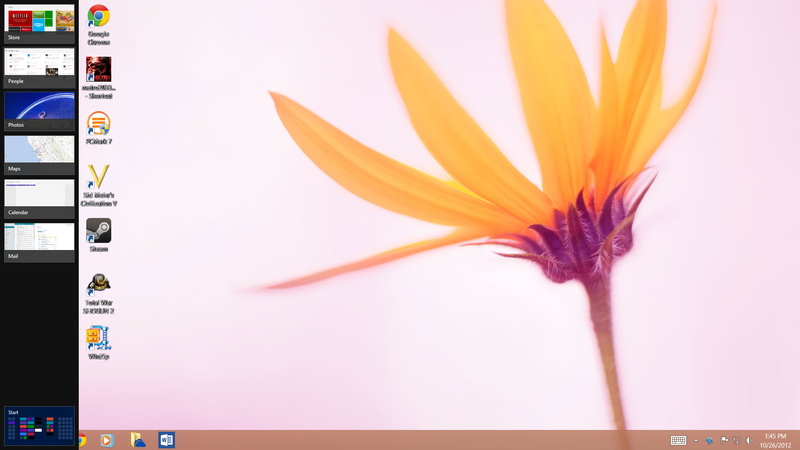 Simple Start menu pops up a list of system tools wherever you are in Windows 8. On the desktop, the mouse behaves a little differently. Moving to the lower left always brings up a peek view of the Start screen. Click, and you return to the Start screen—just like clicking on the start button in Windows 7 or earlier will bring up the Start menu. I'll touch briefly (pun intended) on using the touch interface, in case you're lucky enough to have a multitouch-enabled device. Again, I'm just going to cover the basics. Swiping your finger from the outside right of the screen inward brings up the Charms bar. Swiping inward from the left side brings up the most recent Windows 8 app. Doing this will not bring up a desktop app (more on the differences between Windows 8 apps and desktop apps shortly.) But if the desktop app was the application you used most recently prior to returning to the Start screen, swiping in from the left will bring up the desktop. If you swipe in from the left, then abruptly change direction and swipe off the left side, you'll see the app-switching bar listing all currently running Windows 8 apps. You can select any of them by touching the peek icon. Note that desktop apps are simply shown as a single representation of the Windows desktop, even if you have multiple desktop apps running. The modern context menu (akin to the right-click menu on the desktop) is now a bar at the bottom. You bring up the Windows 8 context menu by swiping up. The context settings available will vary depending on the application. Pinch-to-zoom will give you a miniature view of all the items on the Start screen, scaled to fit on a single display. Poking any app tile will return you to a normal scale view.